Great work. This image suits my needs for a small but fully functional image very well. Thank you. Did you think of providing another version with the RT-Preempt Patch applied? Would be nice! No plan to do that. One small thing, I want to install “python-rpi.gpio” but I get “Unable to locate package python-rpi.gpio”. The library should be in the sources right? Everything else seems to work great so far. 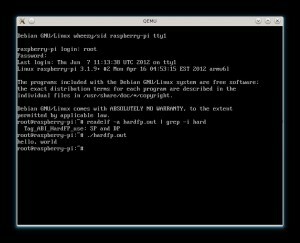 Try installing python-pip and then running ‘pip install rpi.gpio’. That got the library on my system. I’m trying the minimal system with Midori (browser) and matchbox (window manager) to get it to work. Now when I start one of the two, always comes he can not open the display. I have also matchbox, midori, x11vnc, x11-xserver-utils, unclutter and xinit installed. You must specify a Desktop Manager first. I think that you want a slim GUI, so you can use maybe twm or openbox. Now you need a mouse and click with the secondary button to get a small menu, and the first option will be a xterminal. In case that you want test with twm, click with the primary button in the mouse and you get also a menu. Restart your GUI with a exit or only restart your RPi. When you return to the GUI, you menu will show a Debian option. Thank you very much bro , it saved my life , im not a linux expert is there any way to get only a command line like xserver with working keyboard ? cause i want to build a carpc , and i want to do it as fast as possible . May be you must try adding a command like xterm on a script file in the cron daemon or maybe on the file ~/.bashrc. If you are using Openbox, you can specify keys to invoke commands, check for rc.xml file on its site. i noticed one issue today. everytime i reboot my pi, it resets time date to 1 jan 1970.
i changed etc/ntp.conf to 8.8.8.8.
restarted ntpd. still no luck. I manually set the time on pi. I am using my pi with wifi card. No ethernet card plugged in. Any one facing same issue. i have tried to set the time on pi manually,then rebooted it.it remains 1 jan 1970. In there select your zone and city. At exit the same application, it puts the date-time for your timezone selected and the UTC date-time. Try restart after that. If that works for you, you’ll see the date-time desired. Noticed the same – after a reboot the first entries in the syslog are dated 1970. That’s because the Pi got no HW clock and the ntp service gets started after the syslog service. Added a line for my local time server to /etc/hosts e.g. “192.168.1.1 timesource”. Added a line in /etc/init.d/rsyslog to run ntpdate before syslog gets started. This will only work at boot time because later the ntp service is already running and locking the ntp port. So that’s why I redirected all output of ntpdate to /dev/null. I fixed my NTP problem. I have configured ethernet card with a static local IP (only for initial installation/configuration). My wifi USB nano card is the main NIC I use my pi for connecting to internet. Somehow my ethernet card was being treated as default router in ‘netstat -r’. My Ethernet is always un-plugged. I only connect a cable to PI if I have to re-install it. I removed the configured gateway from /etc/network/interfaces. Rebooted it and voila. My time is syncing now correctly. To verify it, I again enabled the gateway entry for eth0. Rebooted and time/date switched back to 1 Jan 1970. Will Pygame run on it? Yes it works with B+. They both should work. Hi, What’s the last version available? amazing job! I will try to improve the image if I can! that’s really cool! continue on this way!! Thanks for sharing! I used this as the base for my Raspberry PI router. One thought: would it make sense to set gpu_mem=16 in config.txt since this is a minimal command line only image? For first, thank you this great image, i am happy about to use it. My only problem is, i am a bit confused about some conception, and would ask for tipps. I found “/dev/mmcblk0p3″ as swap. If i turn it out (i think simple remove that line in /etc/fstab, is that enough? ), could that make any problem? I found main partition as ext4. Ext4 mostly uses journaling. Is it turned off? Or writeback cached? We have some log in the system. In case i would like to use image 7/24/365, will that fulfill sd card? For example “/var/log/messages”. Is it possible to redirect all the log messages to /dev/null? Please add this info in tutorial. Hello. Tell me please, is there MMC driver on kernel? Tell me plese is it possible to boot from mmc? I don’t remember, but you can check the raspbian kernel config becuase that’s what I use since a few versions. thank you for this kernel image. Does it have the SPI module built in? When I try to do “modprobe spi-dev” it just says “Module spi-dev not found”. “modprobe spidev” gives no error, but then the spi module is not listed when doing “lsmod”. Hallo, Your Image working well on 1 of my RPi. Its Small and without X. Thanks a lott. But after all changes I need for My Project I recognise that networking only working on this one of my 6 RPis. They start normaly but ifconfig shows only lo: and “ifconfig eth0 up” shows “no device eth0″. Maybe you are using and sharing the SD cards in several rpis. If this is true then you must edit /etc/udev/rules.d/70-persistent-net.rules. You must see several lines with all the Mac address from any RPI used with the card. Only delete them and restart your rpi. After that you will see your eth0 up and working. Did you configure on one pi – say – a Pi model B, and the ones that are not working are the B+ model (or the opposite way around)? also have a look at http://unix.stackexchange.com/questions/110496/cloned-linux-system-and-etc-udev-rules-d-70-persistent-net-rules, it may apply. Hi guys. I’m having a slight problem. After flashing the SD card, installing the image, and putting it into the raspberry pi, the only light that turns on on the pi is the red light. Nothing else works now. Nothing shows up on the screen either. SSH times out. Has this happened to anyone else? Any suggestions? I guess I should add some details. I am using OS X. I also have not run gparted on the image because there doesn’t seem to be a distribution for OSX. I am also in New York, and am using the London, UK download, if that makes any difference. Hmm. Can you boot the GParted linux live distribution from a USB drive, then use that to check the partitions for errors? I suspect something went wrong when the image was written. I shouldn’t think the download location matters, as long as the MD5 checksum matches what darkbasic listed above (and which I reproduced here for the latest image). I mean to say that you should try to boot GParted on a usb attached to your Mac, then use it to check the sd card which should also be plugged into the Mac. The problem that might arise here is that booting from usb can be a bit of a pain, so it may be easier just to erase the sd completely and rewrite the image onto it. Why the partition table is differente from the original Raspbian? Is a good choice to have a Linux Swap partition in a system without a true hard disk? (remember that Raspberry has only the SD Card). Because I created the image from scratch and because the original pi had half the ram. In the next image I will remove the swap partition. Do you think is right? Is possibile now to resize the /dev/mmcblk0p2 to expand filesystem? Any suggestion? I just push raspbian_wheezy_20140726.img to SD card. I have problems to get up working my TP-LINK TL-WN722N adapter which uses ath9k_htc driver. This adapter is pretty much supported on wheezy raspbian out of the box. when i run lsusb i really see this adapter but it is not assigned as wlan0. I have another adapter RT5370 which works pretty well. I would like to get running this TP-LINK TL-WN722N on this compact image. Any tips will be appreciate. Make update your minimal image from official Rasbian image from 2014-09-09 (Version: September 2014), please… Thanks. Could you update this for the September image and enable the official repos by default? Fantastic initiative !!! I needed to setup a very minimal headless RPi with just NTP, NFS, SSH and Deluge (daemon and web interface) and all was up in no time ! I only have a STRANGE problem. I need to change eth0 IP from DHCP as in your untouched image to a static IP in my subnet. add the address, mask, gateway, network and broadcast values under it. but when I reboot I cannot find the headless server nor at the static I just specified nor at a DHCP address …. To fix I mount the SD into my Ubuntu box, reedit the file and put back dhcp and all goes well with eth0 getting the usual DHCP address. Any ideas ????????? Thanks a lot and ciao from Roma ! I was unable to find what building/development environment you were used. Could you show where to find (may be write) explanation for building environment? Hello, how can I extend my disk space? On Raspbian I could do raspi-config and extend it, this is not possible with this distro. Hi, I’ve got the OS loading, but when I try to log in it won’t accept the details, am I doing this right? Thank you very much! This image saved a lot of my time! Hi, that’s Works fine on pi b+. * configure a wifi adapter (chipset rtlink 5320) with wpa ? (detected when plugged in & create wlan0)device. * set a minimal X env ? * it’s recommended use a usb charge of my cell nokia lumia (5v 500ma) OR a more power (1, 2A amps) ? is possible install image on usb sticky? I had the minibian installed and running since around Christmas last week and everything went smoothly. I got to say, though, that having set up Arch Linux a week earlier helped me gain the knowledge and experience to get everything working on this minimal image. My first priority was getting it networked with WiFi. And since I don’t have access to the router, I had to configure my PC to share internet through its ethernet port to the Pi. Tip: if you’re connecting to a WPA network, you MUST install wpasupplicant. I keep things simple by just editing /etc/network/interfaces and reboot. Thank goodness the wireless drivers were available and up to date for my device, saving me from having to deal with fetching that. Got your image running on a 4 gig Sd card; all went beautifully until I wanted to install deluged and I got the message:”No space left on device”. 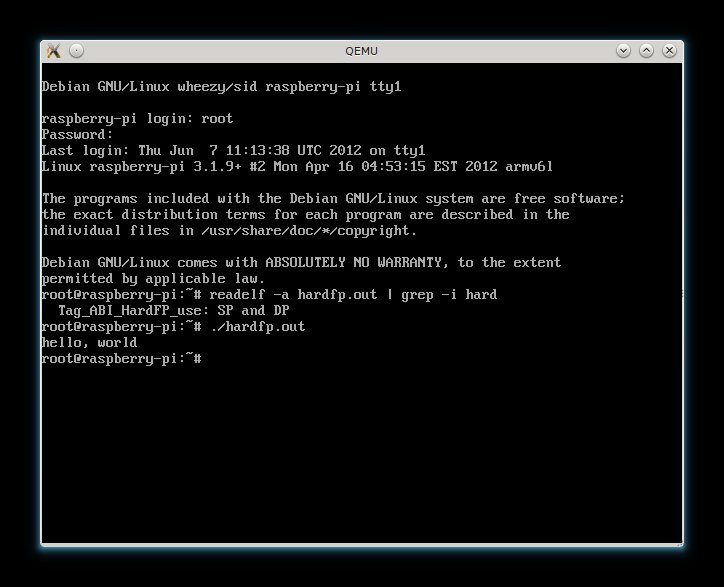 Do I have to go thrrough GParted to expand the partition since there seems to be no raspi-config…? Yep no raspi-config and the root partition isn’t last so you can’t even resize it if you get raspi-config installed. It is for this reason I use Minibian. Thank for the post i love ubuntu/debian OS but i didn’t want all the overhead of the gui this is perfect! Hi, the image doesnot fit onto my 1GB MicroSD Card. Would it be possible to reduce 1MB? Not all 1g cards are 1g . . . the vary a little bit. So put it on a bigger card, then use gparted to change the sizes, and dd each partition to the other card. This does work as I have done it. Your image is faster and lighter and comes with the bare minimal software. You could include a guideline on how to extend the root partition to the size of the SD Card from the command line.